The disclosures last year about government monitoring of Americans, while sensational and much over blown, are nothing compared to what is really happening as state, and local governments as well as businesses increase monitoring of "metadata" and develop huge databases where no one truly has privacy. I am reminded of one of my favorite sayings: "Just because you're paranoid doesn't mean that they aren't after you." Joseph Heller wrote that line in Catch-22. There is no way, it seems, to go off the net. An article in the New York Times yesterday describes the increase in postal mail monitoring in the United States. The opening paragraph is below. Every time we use a credit card, make a phone call, send an email, or even drive on the highway; we are being monitored. The Viper ALPR Camera Solution is a standalone “All-in-one” plug-n-play DSP Based camera system, that automatically detects vehicle license plates for fixed installations up to speed of 30 mph. 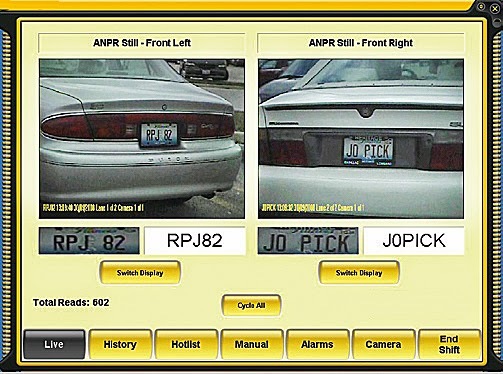 Using advanced ALPR algorithms and simple web-based configuration GUI, the Viper solution performs three functions in Real-Time (R/T): Analyzes the video input, captures vehicle license plates, and sends results to the hosted server over the network (local or cloud-based solution). As if that isn't disconcerting enough, Maryland has a web page devoted to the Maryland LPR program. Every time we drive anywhere--we are being watched. While I agree there is some utility in monitoring license plates and there is no expectation of privacy on the highways, where does it end? How long is this data retained? Who can access these databases? Under what circumstances? Where does the monitoring stop? I guess I have questions. Why do governments and businesses need all of this data? And there is a lot more data being collected--monitoring citizens not suspected of a crime. Someone needs to take these issues up and start ensuring our privacy is protected now and into the future.